Hi there! My name is Cassie, and this is my story. I met Jonathan and David at the Beit CURE hospital in Zambia in 2009. These brothers are like no other people I have ever met before. They share the same disability, and the same joyful heart and it's evident the first moment you meet them. 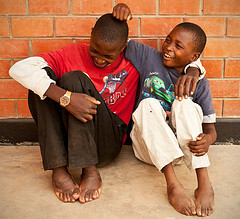 They were both born with club feet which kept them from living life as a normal Zambian boy. They couldn't run, jump, play soccer, or do normal everyday tasks. But praise the Lord, their story doesn't end there. This is Jonathan and David today, 3 years after their life changing surgeries. I can't help but experience tears of joy as I look at the pictures and read the stories of Jonathan and David growing and healing. CURE International is changing lives everyday, and I cannot wait to be a part of it! Jonathan and David are no longer outcasts in their village. They are encouraging other patients at the hosptial who are going into similar surgeries as they had. They are playing soccer with their friends. And most importantly, they are proclaiming the word of God. "Jonathan and David get it. They’ve been there. And they love helping people who used to be just like them.This is a perfect example of what CURE does. We heal broken bodies, and through that are able to change hearts."